Nvidia released the graphics driver 388.71 WHQL for Microsoft's Windows operating system today. The graphics driver comes with Game Ready support for the smash hit Playerunknown's Battlegrounds, support for CUDA 9.1, and several driver fixes. 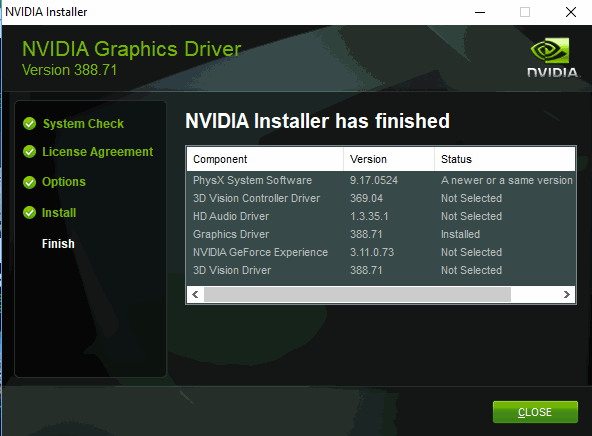 The new driver is already available on Nvidia's official drivers download website, and to users who run the GeForce Experience software on their Windows machines. It is recommended that you read the following resources carefully before you run the update or installer. It is highly recommended that you install only the components that you need, and not all of the components. If you don't make use of 3D for instance or have the necessary hardware, you may not want to install the 3D components that the driver comes with. Game Ready support for PLAYERUNKNOWN’S BATTLEGROUNDS. Added or update SLI profile for Warframe. YouTube video flickering in fullscreen mode. Video artifacts when pausing videos on YouTube on notebooks. Lines that appear across the screen when Windows boots. TDR error, screen goes blank while burning a Blu-Ray disc at high resolution on NVIDIA Titan V hardware. Driver may not install or be recognized on notebooks with Geforce GTX 1080 hardware. Star Wars Battlefront II hangs when the game is launched in DirectX 12 API mode on Kepler GPU systems. Gears of War 4 players may experience a Bluescreen when they play the game on Pascal GPU systems. The operating system may fail after installing a Geforce Titan (Kepler-based) graphics card on a Threadripper-enabled mainboard. Systems with GeForce GTX 780 Ti cards may have no display output when the card is connecting the Display Port and two DVI monitors. G-Sync displays may go blank on Nvidia Titan V systems when you switch between different overclocked memory clocks several times. Check out the release notes for the graphics driver release for additional information. Nvidia released the graphics driver 388.71 WHQL for Microsoft's Windows operating system today featuring Game Ready support for PlayerUnknown's Battleground. The accompanying article is in Dutch, but the interview is in English if you want to watch it. The game looks pretty cool and I might have a go at it later although my system doesn’t meet the minimum system requirements as far as the GPU is concerned.